Erbatax Temple is carved into the rock of a cliffside, a couple hours dusty hike from the nearest village. People used to live much closer to the temple long ago, but those settlements are gone. The temple proper has always been open with a wide stair leading up into the hallway of columns and the interior chamber. There is only a single side hall off the main chamber, and it is closed off by a stoutly built wooden door reinforced with iron banding. If there is something on the other side of that door, it has probably been in there for a long time, judging by the layer of dust covering the floor. I did the hatching and shading for this one a couple months back, I think, but it never got scanned. So I had to print out the base drawing and do the hatching and shading on it again. Fortunately, I enjoy doing the hatching, so it didn’t take a lot of time to get this done, and this time I remembered to scan it. This is mostly a spiraling, one-way path. There are some side rooms, but it doesn’t afford a lot of options, just press on or quit and go back. That’s supposed to be water gushing out from the wall at the top, then following the stream down the page and disappearing into a small opening at the bottom of the page. It read that way a little more clearly in the plain line drawing than it does with the shading on top of it. 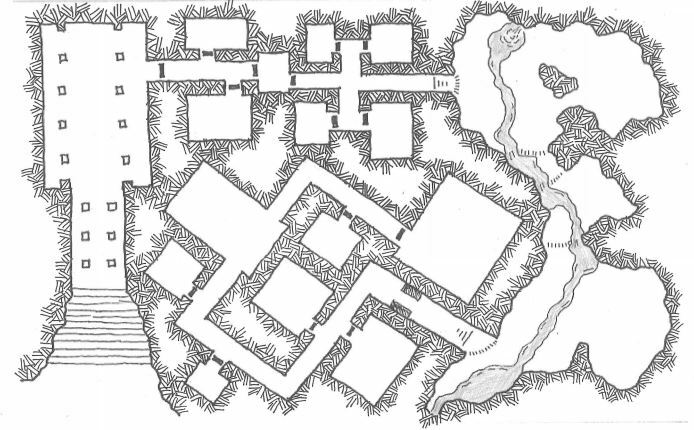 There’s something about the juxtaposition of the rectilinear halls and rooms with the cavern section on the right side of the map that I really like in this one. It seems it has taken much longer than it should have to get the first UnFurnished Dungeon completed. There has been (and still is) a lot of format experimentation going on. But, among the others, there is now a version making its way through the OBS approval system (though it probably won’t be greenlighted in time for their Christmas In July sale). Part of what we’re experimenting with is different printing formats. For the OBS version, it is formatted as a 7.5″ x 9.25″ page. That qualifies it as a small item, rather than a large one, and makes it less expensive to print. It’s also going to be just black & white interior. The PDF is the same size, so most people who get that and print it out are going to have wide margins all the way around. There have been other sizes explored, as well, including 5.5″ x 8.5″ (classic white box/digest size), full 8.5″ x 11″ (standard letter), and a fold-out 3.5″ x 8.5″ that could be mailed in a standard business envelope (that we would distribute directly, and that might be even cheaper to produce and to mail, at least domestically). 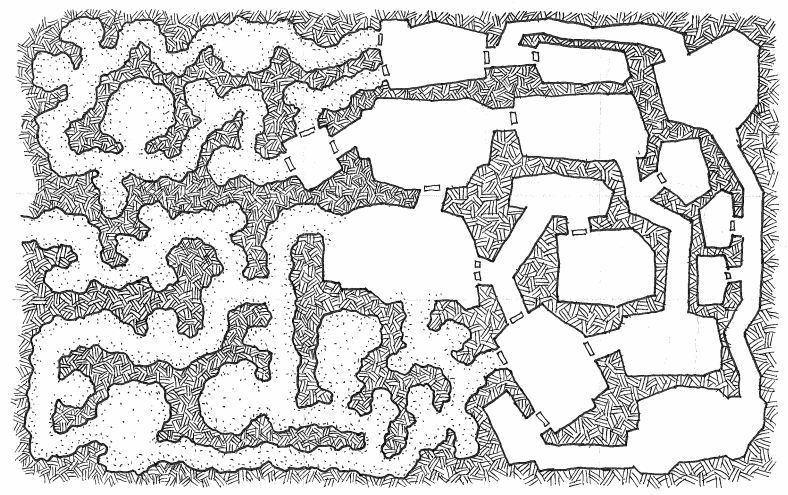 The UnFurnished Dungeons were going to be a Patreon benefit, as well (and that’s still part of the plan). I haven’t done much more to update the Patreon site recently, though I’ve seen that they are making some improvements to the systems there. If you are interested in gtting this as a Patreon supporter, I’ll make sure you get a copy, too. This system of halls and chambers is formed almost entirely of high-grade crystalline quartz. The walls and ceilings are faceted and are made up of thousands of large conjoined crystals. The floor is mostly just a rough and irregular surface of broken crystal, but there are places, especially alongside the walls of rooms, where many sharp crystalline points still poke up making a surface with very difficult footing. There are a range of colors in the rock of this place, from purple and indigo through to pale yellow. Deeper colors are less transparent and harder to see through. However, because of the numerous facets and the crystal structure of the rock, none of it is very glass-like in terms of being able to clearly see through. The ‘bridge’ (where the two hallways cross over each other near the entrance) is a clear quartz so that torchlight from a group passing by would be readily noticed by someone in the other part. Some of the walls are thin enough and clear enough that this is possible in between other adjacent spaces, as well. Although this is not stalactite and stalagmite structure, there are many areas with projections of crystal jutting up from the floor or extending down from the ceiling, and the heights of rooms and halls vary widely throughout the complex. DQ: Poor Brendan’s on sale! The OBS companies (RPGNow, DriveThruRPG, etc.) have a “Christmas in July” sale going on right now through the end of July, and Antherwyck House Games is taking part. Digital products are 25% off and printed copies are 15% off. 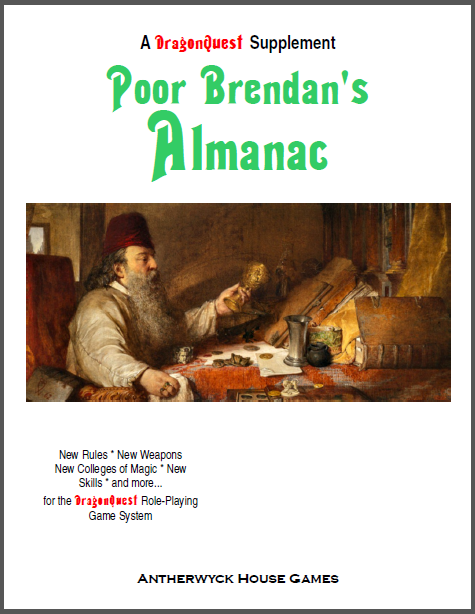 Poor Brendan’s Almanac is now $1.46 for the PDF or $7.60 for the printed copy during this sale. 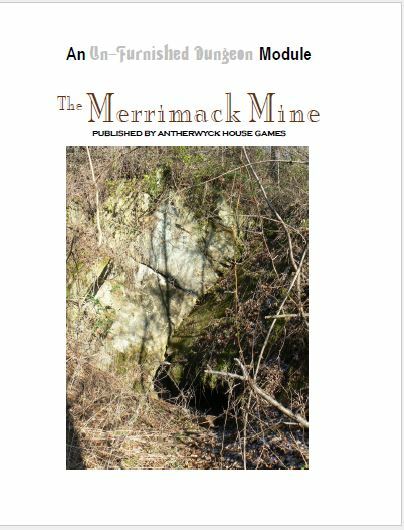 And don’t forget, if you buy the print version, you can also get the PDF for free! The current discussion is to do the next Exquisite Corpse Dungeon based on a map of Europe. This map has a story built into it, but more from an overall backstory for the whole thing, rather than a room-by-room breakdown. So this isn’t going to become an Un-Furnished Dungeon (although it would be easy enough to key it up and lay it out in a booklet form). 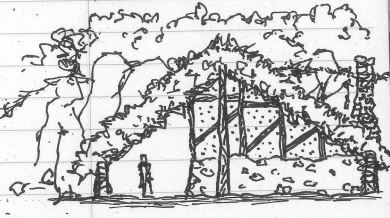 This was an earlier version of the same sort of feature entrance I used for my bit of the Exquisite Corpse dungeon. 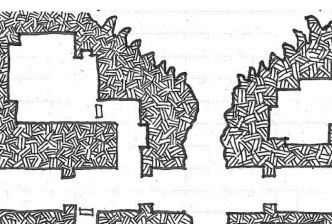 It started off with the opening maw (which I obviously thought was a sufficiently cool feature to plagiarize myself later on), but then I got distracted by the idea of contrasting the very twisty, writhing passages with some very square rooms. The four corner blocks were set, and it seemed interesting to have those connected to the rest of the map with straight line halls. The intersections between the two then became a kind of cuff-like knuckle, and the image arose of this as a set of confinements to restrain a huge monster. It reads as some kind of wyrm or tentacled beast with a great open mouth that had been shackled and held in some fashion, but now vanished. The tentacles, and the blocks and shackles that had anchored it, have all disappeared, and the open passages are now what remains in their place; it is a negative space created in rock from what was once there. Was the creature buried in the ground and then, using its powerful but unknown magical abilities, displaced itself into some other dimension, leaving the space where it had been carved into the side of a mountain? The outline for this was done a while ago, and I only recently got to adding some hatch to it. It seemed to call for something different than the usual ground hatch, and this seems to be a good alternative for this case. I was doodling this on lined paper, so this’ll take some work, or some rework to do anything with it. 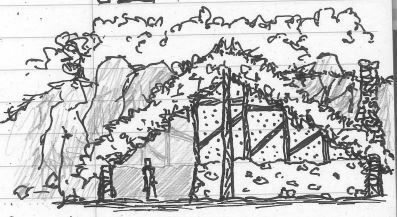 But, I think it shows the general idea for this location (a rough longhouse structure in the Wilderness built of stone and timber, backed up against a low cliff and roofed with felled trees). This wasn’t meant as finished art, and it probably won’t end up in the adventure; it’s the kind of thing I might do in a game I was running for my own players, but it’s not finished art. There will likely be a plan of this place, and maybe also a section through it to show what it’s like (or just a good descriptive paragraph). The earlier parts of the caves, closer to the surface, were easy to get through. The colorful rooms with fantastic stalactite and stalagmite forms. The walls with crystalline flecks glinting in the lamplight. The rivulet coming from the tiny passageway and running across the floor like a miniature river carving its way across the floor before disappearing into the narrow crevasse for places far, far deeper. Then came the Burrows, and they were something different. These were not natural caves. These were round tunnels that someone -or something- had made. They twisted around, writhing through the earth, almost. Like a decapitated snake, thrashing back and forth. 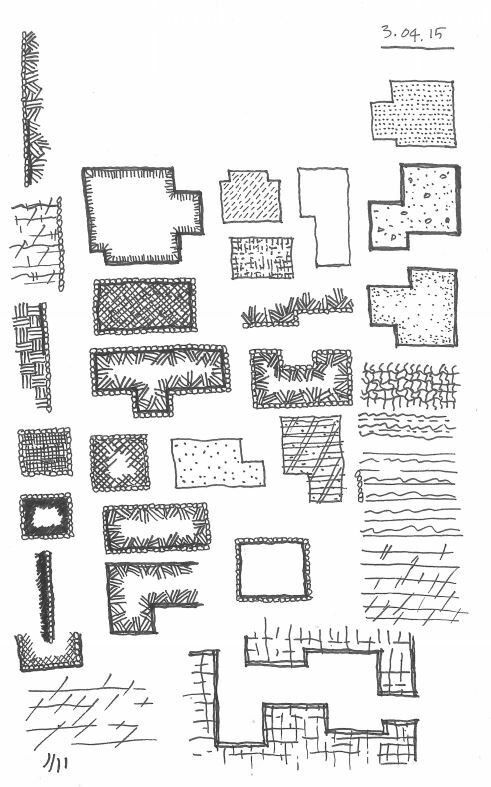 Some experiments and variations on hatches, patterns, and fill graphics. I think the fougou-style experiments were on my mind, and making a more distinctive separation between the wall and the poche pattern was obviously something I was working at. But some of these were also just working up some other patterns to try out (like the Aladdin Sane pair). I think there are some here I still need to come back to and try on a more complete piece. 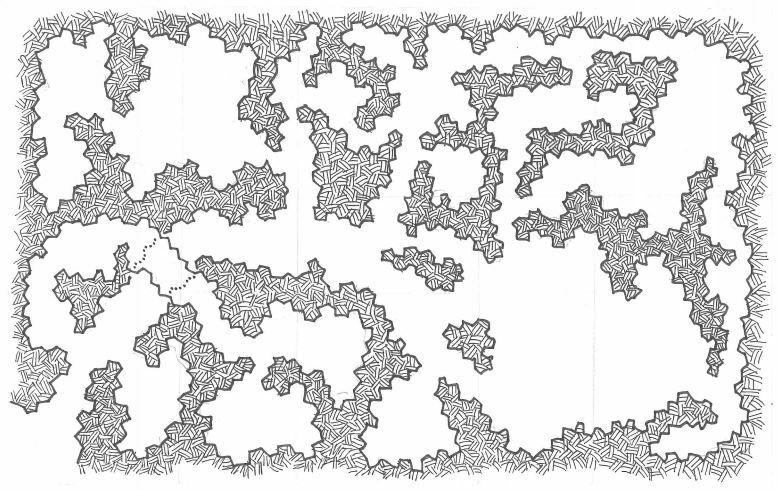 A couple of new geomorphs with very little relation to one another; sometimes diversity is the unifying theme. Copies of these are also in Dave’s hands to add to Dave’s Mapper, so you should eventually be able to stumble across them there, as well. 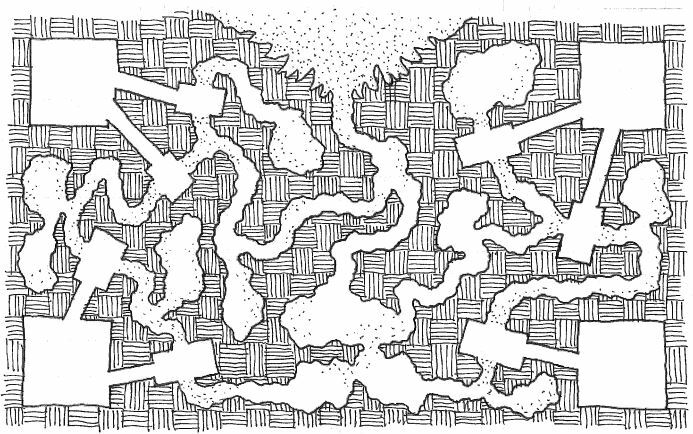 If there’s enough interest again (and I’m really hopeful that there will be), I’m planning to run another Exquisite Corpse Dungeon this summer. It was fun the first time around. The idea has been picked up by a group of Russian-speaking map makers (who are doing a vertical dungeon section rather than a plan view dungeon), and their version is underway right now. The end result was something more amazing than what I hoped for when I first floated the idea and nudged a couple people to see if they were interested. And, it even ended up as a hardcopy version which is being shipped to Mythoard subscribers right now. I have a couple ideas about how to change things up a little bit and make it even more interesting this time through. But, it’s better to get input from everyone as we start to organize it.